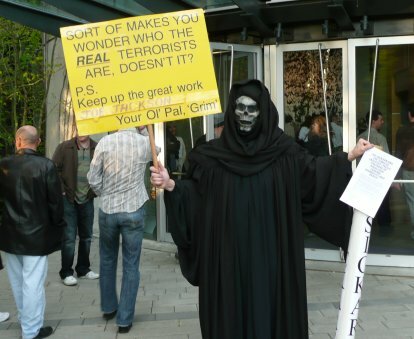 On May 5, 2008, members of Airspace Action on Smoking and Health protested a Joe Jackson concert, held at the Chan Centre for the Performing Arts at the University of British Columbia. We learned about Joe Jackson and his "allegiance" to the tobacco industry a few months ago. At that time, Airspace president Errol Povah attempted to contact singer/songwriter Jackson (via his website), to challenge him to a public debate on any and all aspects of smoking/tobacco control. While Povah didn't get through to Jackson, directly, one of Jackson's reps did the talking for him... and made it clear that Jackson had neither the time nor the energy -- nor the inclination -- to debate the issue, "now or ever." We urge you to check out Jackson's website -- www.joejackson.com -- and click on the "SMOKING" link at the top of the home page. As you will see, Joe is not just your average, run-of-the-mill smoker; he's clearly a puppet of the tobacco industry. He denies getting paid by the tobacco industry; we have no way of proving otherwise, but obviously, we have our doubts about that. In any case, whether Jackson likes it or not, he's a celebrity and a role model... and as such, he should be ashamed of himself for so aggressively promoting such an addictive, disease-causing, debilitating and deadly product...the only legal product which kills when used exactly as intended by the manufacturer! As we stated in our hand-out -- or "Program!" as we called it -- we didn't seriously expect any Joe Jackson fans to, after reading our material, change their minds about going to the concert... and leave. But we do encourage everyone to think about the issue... and Jackson's role in promoting a product which is, ultimately, responsible for one of the biggest drains on our "in-crisis" health-care system. I attended the concert in Vancouver, last nite... had I been aware of Joe's position on smoking, I would not have attended. There can be no excuse for supporting this vile and sickening addiction. I'm thankful to Vancouver Airspace for enlightening me on Joe's position ... I will not buy any of his music until he comes clean. 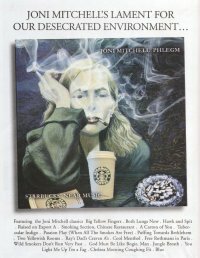 From Frank magazine: “Joni Mitchell’s lament for our desecrated environment”. Song titles include “Big Yellow Fingers” and “Wild Smokers Don’t Run Very Fast”. Click here to view the full-size image. "Deadly Fumes: British Columbia workplace death toll attributable to secondhand smoke 1989 to 1998" is a report published by Airspace in 2001. You can view the PDF by clicking here. Singing Christmas carols in front of Imperial Tobacco's Vancouver office was an annual event for Airspace, until Imperial shut down this office and relocated it to Calgary. However, the carols that we sang are available for use by other Sworn Enemies of the Tobacco Industry. Included are such classics as "Law Suits are Comin' to Town" and "We're Dreaming of a Smoke-Free Christmas".